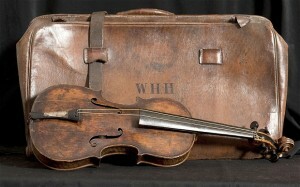 *Wallace Hartley’s violin will be on display at Titanic Pigeon Forge until mid-August. *Lion Heart Autographs will be putting up for auction a custom card filled out by a Titanic survivor aboard Carpathia. The custom card was filled out by first class passenger Caroline Bonnell. The card is estimated auction price is $8,000-$10,000. They are also auctioning off ten telegrams related to the sinking of the Titanic including two from evangelist “Billy” Sunday. The estimated auction price for the telegrams is $3,000-$5,000. The auction is being conducted online through 15 June 2016. *Believe it or not but there is something called Tourism Oscars reports Belfast Telegraph. And for the first time since these awards have around for 23 years, an Irish attraction called Belfast Titanic could possibly win the award. Megan Ross, age 10, with her winning design for Nomadic’s 105th anniversary cake. 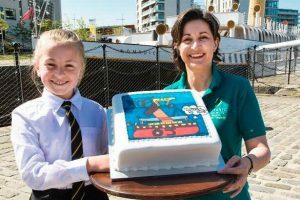 *Megan Ross, age 10, won a contest to design the 105th anniversary cake for SS Nomadic Belfast Live reports. Way to go Megan! She also won the opportunity for her class to visit the last remaining ship of the White Star Line. *A celebrity recently, desiring for more attention or something, decided to be like Kate Winslet in James Cameron’s Titanic in baring her top in a selfie. Sorry but I do not see the guys racing to see this one. *People visiting Titanic Belfast of late have been experiencing a very warm experience. Which apparently is bringing out a lot of people since it does not usually get near 70F/21C. Temperatures have soared up to 23C/74F. Usually travelers are advised to bring a sweater, a jacket for rain or cool nights and an umbrella. You can skip the sweater but keep a jacket and umbrella handy. Weather Underground reports that rain is expected in the next few days. A perfect opportunity to slip inside a small place for some good company and food as well.